UPDATE: See my email to Tom Jefferson (20 March 2018) calling on him to retract his scientifically unsound review on aluminium and vaccine safety, which is impacting on vaccination policy and helping to facilitate over-vaccination with aluminium-adjuvanted vaccine products. Internationally, Cochrane undertakes systematic reviews of primary research in human health care and health policy, including reviews of vaccine products. I suggest some systematic reviews of vaccine products prepared by Cochrane Vaccines Field authors do not make the ‘gold standard’, particularly Tom Jefferson et al’s review of aluminium and vaccine safety, i.e. Adverse events after immunisation with aluminium-containing DTP vaccines: systematic review of the evidence. I suggest Jefferson et al’s scientifically unsound review has facilitated poorly evidenced acceptance of the safety of aluminium-adjuvanted vaccines. As a consequence, an increasing number of aluminium-adjuvanted vaccines are being added to vaccination schedules around the world e.g. multiple doses of diphtheria, tetanus and pertussis vaccines, and multiple doses of human papillomavirus (HPV) vaccine, among others. The meningococcal B vaccine is the latest to be promoted. The long-term cumulative effects of the ever-growing list of vaccine products are unknown. On 25 May 2016 I forwarded a letter to the then Australian Government’s Chief Medical Officer, Professor Chris Baggoley, challenging Jefferson et al’s review on aluminium and vaccine safety and its influence on vaccination policy, click on this hyperlink to access the letter: Letter to the Chief Medical Officer re aluminium and vaccine safety and vaccination policy. Email to Tom Jefferson re Cochrane aluminium and vaccine safety review (24 March 2013). 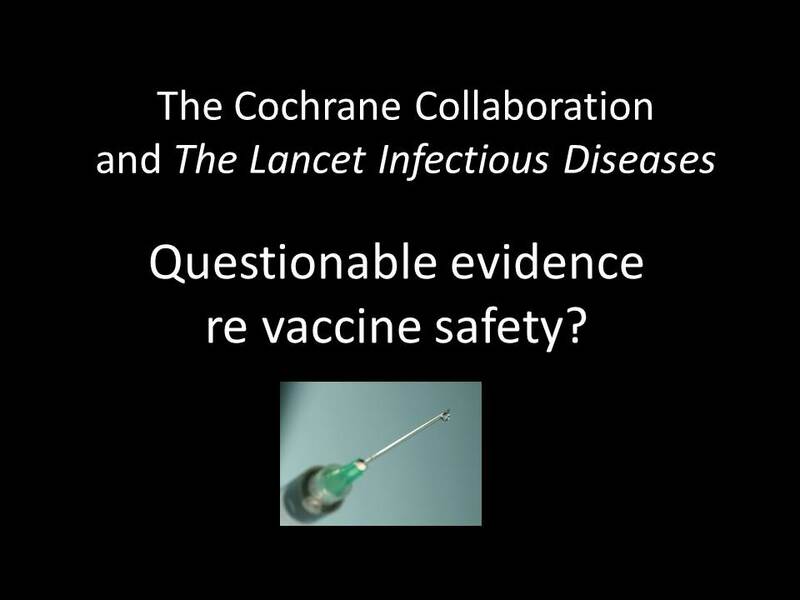 Letter on this matter to John McConnell, Editor of The Lancet Infectious Diseases journal, requesting that this review prepared by authors in the Cochrane Vaccines Field be retracted (11 August 2014). Letter to Dr David Tovey, Editor in Chief, The Cochrane Library, and Deputy Chief Executive Officer Cochrane Editorial Unit / Cochrane Central Executive (16 December 2014). Email to Mark Wilson, CEO of Cochrane, arguing it is incumbent upon Cochrane to issue a public statement formally declaring Cochrane disassociates itself from the scientifically unsound review authored by members of the Cochrane Vaccines Field, i.e. Jefferson et al’s 2004 review on aluminium and vaccine safety (21 February 2018). Both Cochrane and The Lancet Infectious Diseases have failed to address this matter. In relation to the arbitrary second dose of the live Measles/Mumps/Rubella vaccine, Dr Vittorio Demicheli, first author on the Cochrane Intevention Review: Vaccines for measles , mumps and rubella in children is copied on my letter to Professor Paul Offit (6 September 2013). My letter questions the ethics of mandated revaccination of likely already immune children with a second dose of the live Measles/Mumps/Rubella (MMR) vaccine. Dr Demicheli was also copied on my letter on this matter addressed to then Australian Federal Health Minister Tanya Plibersek (28 June 2012) and Australian Technical Advisory Group on Immunisation (ATAGI) Chair Professor Terry Nolan (11 March 2013). My email to Cochrane Review author Dr Linjie Zhang (11 December 2012) raises questions about whooping cough vaccination and the Australian pertussis epidemic in 2008-2010, relevant to the Cochrane Review: Acellular vaccines for preventing whooping cough in children.